These dramatic photographs put a vivid human face on the perennial fight for freedom. Their clarity emphasizes the importance of recognizing a basic truth: the price of freedom is eternal vigilance. The price is also courage and persistence. The burning fire of Prague Spring was never extinguished despite the heavy hand of Soviet repression. Persistence and courage remained and the embers once again burn brightly. Lessons from the past are too easily forgotten. Our memories need refreshments so that we may keep moving forward with freedom as our guide. 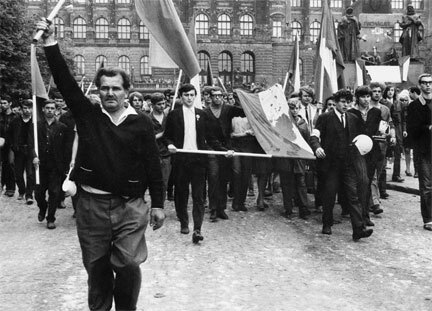 In 1969, Alexander Dubček’s reforms ushered in a period of liberalization that loosened restriction on free speech, media and economic activity. Unable to halt the march of these universal democratic values, the Soviet military turned to more aggressive means, deploying its forces into the streets of the nation’s capital to crack down on citizens exercising their fundamental rights to speak freely and assemble peacefully. It would be another twenty years before the Velvet Revolution would allow the Czech people to shed the shackles of Soviet oppression. But the courage displayed by ordinary Czech citizens in August 1968 laid the groundwork for the Communist Party’s eventual collapse by exposing cracks in the Soviet system that could no longer go unnoticed. Through his arresting images from the street of Prague during that fateful August, Paul Goldsmith evokes this spirit of resilience that drove throngs of Czech citizens to stare down Soviet tanks in the name of liberty. His timeless photographs capture the hundreds of anonymous faces—some battered and blood-soaked, others youthful and resolute—united in their fierce determination to see freedom triumph over tyranny. The citizens captured in this volume were not mere witnesses to history—they helped make it.